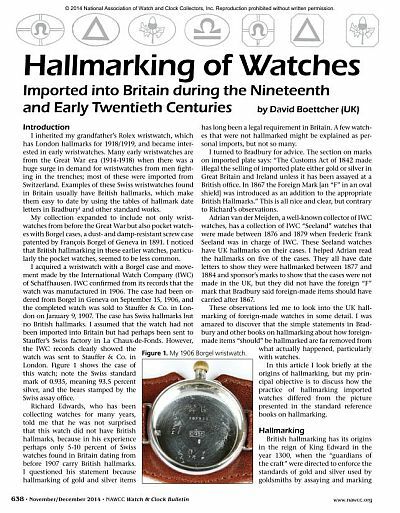 I have been investigating the hallmarking of watches imported into Britain for some time. I soon realised that the British hallmarking of imported watches is not correctly documented in the standard works on hallmarking - Jackson's, Chaffers, Bradbury, etc. Well at least it hasn't been - until now! NAWCC Watch & Clock Bulletin article. There is plenty to read about the subject on this web site, for example my case marks page discusses marks in watch cases in general, British hallmarks in imported watches from 1 June 1907 are discussed at British import hallmarks, and there is a lot of research on my page about British assay and hallmarking, which formed the basis for an article "Hallmarking of watches imported into Britain during the nineteenth and early twentieth centuries" published in the NAWCC Watch & Clock Bulletin as pictured here and which, thanks to permission from the Editor, you can download. I have been working with Emma Paragreen, the Curator/ Librarian at the Sheffield Assay Office, for some time on this topic. Emma was happy to include a summary of the information that I revealed in my article in a new edition of Bradbury's Book of Hallmarks, which is published by the Sheffield Assay Office. Today a copy of the latest 2014 edition of "Bradbury's Book of Hallmarks" dropped through my letter box, and I was happy to see that it finally covers the hallmarking of imported watches, and recognises in a new section about imported watches that the new hallmarks that were used on imported gold and silver items other than watches from 1904 were not used on imported watches until 1 June 1907. The new edition of Bradury also explains that in 1798 watches were made exempt from the duty on gold and silver items that had been introduced in 1784, which is why you don't find the sovereign's head duty mark, always shown in tables of date letters, in watch cases after 1798. This 2014 edition of Bradbury is the only work that correctly discusses the British hallmarking of imported watches. If you are a watch collector, this version of Bradbury makes all previous versions, and all the other books about British hallmarks, obsolete. The 2014 edition of Bradbury is now available to buy from the Sheffield Assay Office. It is a small paperback book that fits easily in the pocket and costs just £10 + p&p, which is great value. 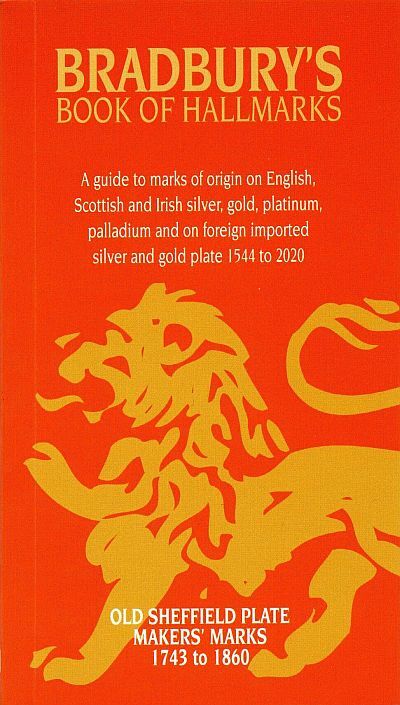 In addition to tables of date letters, there is a tremendous amount of information on British hallmarking crammed into it, providing the key to marks on English, Scottish, Irish and imported silver and gold, and it is currently the only reference book that correctly describes the British hallmarking of imported watches. I have been working with the Sheffield Assay Office to make the latest version easier to read than previous editions. Make sure you get the latest edition with the "Chinese red" covers as shown here. Armed with Bradbury and a copy of my paper you will know as much as anyone about the hallmarking in Britain of watches, and be able to read and understand the hallmarks in any gold or silver watch case that was hallmarked here. If you collect this type of watch, a copy of Bradbury should be on your desk, and in your pocket when you go to auctions or flea markets. You will know more about hallmarking than most sellers, which puts you in a powerful position. You could easily recover the cost on a single watch that is misidentified by the seller, or avoid a costly mistake. There is currently no facility to order on line, but if you telephone the Sheffield Assay Office Accounts Department on 0114 231 8152 (+44 114 231 8152 from overseas) they will send you one hot off the press - please tell them that you got their details from me. Articles in the NAWCC Watch & Clock Bulletin are copyright and usually only NAWCC members can see them, either in the physical Bulletin or on the NAWCC web site. However, after a request from the the archivist of the Incorporation of Goldsmiths, who looks after the historical records of the Edinburgh and Glasgow Assay Offices, the editor of the NAWCC Bulletin has allowed the article to be made publicly available and it can now be read or downloaded by clicking on this this link: DOWNLOAD. If you want to know how to read a British import hallmark, go to British import hallmarks; if you are interested in reading a British hallmark, go to British hallmarks. If you want to know how to read a Swiss hallmark, go to Swiss hallmarks.